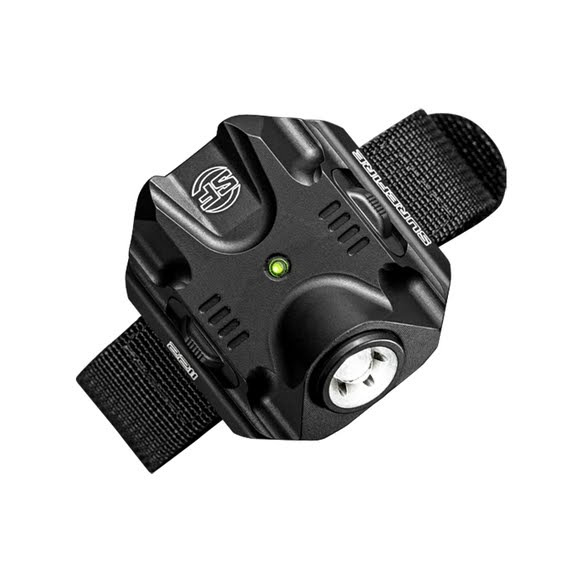 Developed with input from active-duty cops, the ambidextrous SureFire 2211 WristLight straps securely to your firearm support-hand wrist and utilizes a virtually indestructible high-performance LED and specially developed optic to unleash a wide, brilliant 200-lumen beam with a press of either of two ergonomic button-type switches. Developed with input from active-duty cops, the ambidextrous SureFire 2211 WristLight straps securely to your firearm support-hand wrist and utilizes a virtually indestructible high-performance LED and specially developed optic to unleash a wide, brilliant 200-lumen beam with a press of either of two ergonomic button-type switches. In close-quarter engagements this is more than enough light to overwhelm an aggressor&apos;s dark-adapted vision and properly identify and assess threats. Pressing either switch again within one second drops the output to 15 lumens, perfect for closer work while minimizing degradation of the user&apos;s dark-adapted vision. Another press of either switch turns the light off.